Take an intimate small group tour through Tuscany and discover the quintessence of Tuscan wines: the world-renowned Supertuscans. A Supertuscan wine is the utmost expression of quality and winemaking skills of a wine producer and often his signature wine. A precious wine that sometimes is difficult to find outside the latest vintage - or even to get a taste of. Walk to a private garden terrace overlooking the amazing views of the cove and fishing village of Portofino and meet a local producer that will introduce you to his production of olive oil and the local wine. Taste the precious extra-virgin olive oil no house should be without and discover how to prepare delicious sauces combining olive oil with aromatic herbs (such as basil, rosemary and sage). Then taste some local specialties paired with local wine. Take a unique and authentic experience in Cinque Terre while on a beautiful 2-hour hike off the beaten path. You’ll meet your private guide for an exciting day of hiking, on a trail through the famous terraced vineyards of Cinque Terre. 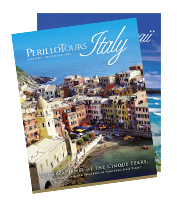 You will enjoy the breathtaking views of the Mediterranean Sea and Cinque Terre Villages. Then, you will reach the local trattoria where you will taste some famous Ligurian dishes and appetizers such as rice cake, vegetable pie, focaccia, anchovies, and local cheese. In between the rolling hills of Chianti you will discover the rich history from the medieval villages, and taste the local delicacies along with the famous Chianti Classico wine. Chianti is a land known for its small towns, medieval castles and abbeys, and ancient wine making traditions. There is no better way to discover the true essence of Chianti than to hike through the rolling hills and vineyards, taste its famous wine, and eat traditional Tuscan dishes. Have the chance to create your own signature wine along with a professional winemaker! Embark on a fascinating hunting experience to the outskirts of Chianti to “dig out” some amazing natural treasures- Tuscan Truffles. The truffle hunt will take place at the site where the famous battle of Monteaperti took place in 1260. Here you will learn all the secrets to the Tuscan Truffles including: their characteristics, properties, differences, and how to store and use them. This hunting experience will take place with an Expert Truffle Hunter and his wonderful dogs. The “Lagotto” (the special dog breed), makes truffle hunting possible. Castles, unique landscapes, rolling hills, and winding roads are just a few of the magnificent views you will admire along the way to Montalcino from Siena. While crossing the heart of Crete Senesi you will have the chance to stop and take pictures of the dune-like hills which have the appearance of a “lunar” landscape due to the grey coloration of its soil. Venture to the beautiful countryside of the Orcia Valley to discover ancient, hilltop villages, rows of vineyards, and culinary specialties while surrounded by unique scents and amazing tastes. Crossed by the Orcia River, from which the Valley was named, this amazing region of Tuscany has been recognized as a UNESCO World Heritage Site in 2004, and it is considered to be a rustic treasure with breathtaking views and picturesque landscapes. Enjoy a full day tour to the Food Valley from Verona and get fully immersed in the flavors of the most famous, traditional products of the region: Parmigiano Reggiano and Prosciutto di Parma. Enjoy a full day tour to Bologna and the FICO agri-food park from Verona. On this true wine expert tour, discover one of the most renowned wines worldwide and arguably one of the most esteemed wines in Italy - Brunello di Montalcino. Take a wine voyage around Italy without ever leaving the heart of Rome with this one-of-a-kind wine and food tasting experience.